A rating method where the rater assigns a specific value on a fixed scale to the behavior or performance of an individual instead of assigning ratings based on comparisons between other individuals. Carried out on behalf of women and disadvantaged groups and members of such groups are placed in dominant positions. A term used to describe voluntary and involuntary terminations, deaths, and employee retirements that result in a reduction to the employer’s physical workforce. Leader determines policy of the organization, instructs members what to do/make, subjective in approach, aloof and impersonal. A popular strategic management concept developed in the early 1990’s by Drs. Robert Kaplan and David Norton, the balanced scorecard is a management and measurement system which enables organizations to clarify their vision and strategy and translate them into action. The goal of the balanced scorecard is to tie business performance to organizational strategy by measuring results in four areas: financial performance, customer knowledge, internal business processes, and learning and growth. An appraisal that requires raters list important dimensions of a particular job and collect information regarding the critical behaviors that distinguish between successful and unsuccessful performance. These critical behaviors are then categorized and appointed a numerical value which is used as the basis for rating performance. An interview technique which focuses on a candidates past experiences, behaviors, knowledge, skills and abilities by asking the candidate to provide specific examples of when they have demonstrated certain behaviors or skills as a means of predicting future behavior and performance. The behavior of the employee which is the subject of measurement and appraisal in terms of whether or not the behaviors shown by an employee are those identified by job analysis/competency profiling as those contributing to team and/or organizational success. A technique using quantitative or qualitative data to make comparisons between different organizations or different sections of the organizations. Paid days off following the death of an employee’s spouse, parent, child grandparent or in-law so that the employee may attend funeral proceedings, etc. The process of identifying and differentiating an organization’s products, processes or services from another organization by giving it a name, phrase or other mark. A pay structure that consolidates a large number of narrower pay grades into fewer broad bands with wider salary ranges. The practice of allowing more senior level employees whose positions have been slotted for elimination or downsizing the option of accepting an alternative position within the organization, for which they may be qualified to perform and which is currently occupied by another employee with less seniority. The deliberate effort of an organization to anticipate change and to manage its introduction, implementation, and consequences. The Criminal Records (Clean Slate) Act 2004 establishes a clean slate scheme to limit the effect of an individual’s convictions in most circumstances (subject to certain exceptions set out in Section 19) if the individual satisfies the relevant eligibility criteria. A one-to-one process between a manager and subordinate, whereby the former will ‘train’ the latter. See also Mentoring. The process by which [an] employer[s] will negotiate employment contracts with [a] union[s]. Competency based pay is a compensation system that recognizes employees for the depth, breadth, and types of skills they obtain and apply in their work. Also known as skill based and knowledge based pay. ‘an underlying characteristic of a person’ ‘motive, trait, skill, aspect of one’s self-image or social role, or a body of knowledge’. ‘People are the source of competitive advantage’. Other systems in an organization can be copied but not the people in the organization. 1. Coercion by threats to act or promises to refrain and includes a resignation given as an alternative to be dismissed. 2. A breach of duty by the employer leading a worker to resign. Employees who may be: casual labor, part-timers, freelancers, subcontractors, independent professionals and consultants. An agreement with an independent contractor. A small group of permanent workers, for example, strategists, planners. The aims and objectives of an organization. A strategy of becoming the lowest-cost producer in its industry. A form of unemployment – rises in times of economic recession and falls in times of prosperity. Now shows signs of being able to withstand increased prosperity. One of the Contingency theories of leadership – developed by Vroom and Yettor (1973). The removal of entities such as financial markets, road and transport from governmental control. The process of delivering educational or instructional programs to locations away from a classroom or site to another location by varying technology such as video or audio-conferencing, computers, web-based applications or other multimedia communications. A procedure carried out in the workplace in the event of an employee committing some act contrary to terms of the employment agreement. If the act is regarded as Gross Misconduct this may lead to Summary Dismissal. The favoring of one group of people to the detriment of others. Related to the process of Negotiation. Known also as Competitive bargaining – The parties are concerned with their respective shares of the benefits available and compete and conflict with each other until one side wins an increased share at the expense of the other. A critical component of mergers and acquisitions, it is the process by investigation and evaluation is conducted to examine the details of a particular investment or purchase by obtaining sufficient and accurate information or documents which may influence the outcome of the transaction. Describes the mental ability an individual possess enabling him/her to be sensitive and understanding to the emotions of others as well as being able to manage their own emotions and impulses. A broad term used to refer to the general management and planning of activities related to developing, maintaining, and improving employee relationships by communicating with employees, processing grievances/disputes, etc. organizational policies and practices designed to meet the diverse needs of employees, and create an environment that encourages employees to remain employed. The process of enabling or authorizing an individual to think, behave, take action, and control work and decision-making in autonomous ways. Based on the notion that people are motivated by a desire for fairness, that is, to be treated fairly and will compare their own efforts and the rewards of others in the organization with a view to judging the fairness of their treatment. An interview between a member of staff of the organization that an employee is leaving to ascertain the reasons for the employee leaving the organization. Should not be carried out by employee’s immediate superior. Used for possible changes. An employee and an employer may agree that the employment of the employee will end at the close of a specified date or period or on the occurrence of a specified event or at the conclusion of a specified project. Forced ranking systems direct managers to evaluate their employees’ performance against other employees, rather than the more common (and often grade inflated) measure of evaluating performance against pre-determined standards. The result of such a process is often brutally blunt: The top 20 percent of performers are amply rewarded, and the bottom 10 percent are shown the door. The right to belong to a union. As protected by the Human Rights Act 1993. The preparation required for the construction of a job description. It is necessary to collect data on the job to be advertised. A duty under Section 4 of the Employment Relations Act 2000 to conduct negotiations where two parties meet and confer at reasonable times with open minds and the intention of reaching an agreement. A complaint brought by one party to an employment contract against another party. An act committed by any personnel likely to lead to Summary Dismissal. A term produced as a result of an experiment conducted by Elton Mayo whereby he concluded that expressing concern for employees and treating them in a manner which fulfills their basic human needs and wants will ultimately result in better performance. The collective knowledge, skills and abilities of an organization’s employees. Additional compensation used to motivate and to reward employees for exceeding performance or productivity goals. A person who works for him/herself but has a contract for services with another person/organization. The study of theories and practices in the workplace relationship. Non-monetary re-enforcers such as praise given to an employee in recognition of a job well done, or a particular achievement. Developed by the International organization for Standardization (ISO), it is a set of standards for quality management systems that is accepted around the world. organizations that conform to these standards can receive ISO 9000 certification. The standard intended for quality management system assessment and registration is ISO 9001. The standards apply uniformly to organizations of any size or description. The preparatory stage for writing job descriptions. A written description of a job which includes information regarding the general nature of the work to be performed, specific responsibilities and duties, and the employee characteristics required to perform the job. ‘Knowledge, Skills and Abilities’ – Key Performance Indicators. Tasks that have been agreed between an employee and line manager/HR with an expectation that they will be completed satisfactorily in the time agreed or as an ongoing task. Knowledge, skills and abilities – the personal attributes that a person has to have to perform the job requirements. A geographical or occupational area in which factors of supply and demand interact. A rate at which the number of people in the labor force is divided by the number of people of working age x 100. Formal and informal training and professional development programs designed for all management and executive level employees to assist them in developing the leadership skills and styles required to deal with a variety of situations. In the event of a redundancy situation occurring, the system of ‘last in first out’ is regarded as the most equitable method of choosing those who should be made redundant. A fixed negotiated payment which is not typically included in an employee’s annual salary. Often times given in lieu of pay increases. An organizational structure where employees report to more then one manager or supervisor. The process of intervention by a specialist in an employment dispute. Provided under the Employment Relations Act 2000. A one-to-one process between an outside trainer and an employee, whereby the former will ‘train’ the latter. See also Coaching. The lowest level of earnings of employees set by Government. A statement illustrating who the company is, what the company does, and where the company is headed. The reason(s) why a person works at a particular job and for a particular organization. Subject to various theories relating to the way they do things. An attempt to explain how people are motivated, in the form of work behavior and performance. A psychological test used to assess an individuals personality type. The process of discussion with a view to mutual settlement usually by the means of a conference. Favoritism shown to relatives by individuals in a position of authority such as CEO’s, managers or supervisors. The process of observing employees while performing their respective jobs or tasks used to collect data regarding specific jobs or tasks. Occupational health and safety – the law relating to the health and safety of personnel at work. The introduction of employees to their jobs, co-workers, and the organization by providing them with information regarding such items as policies, procedures, company history, goals, culture, and work rules. Similar to Induction. A benefit offered by the employer to displaced employees which may consist of such services as job counseling, training, and job-finding assistance. A bar graph used to rank in order of importance information such as causes or reasons for specific problems so that measures for process improvement can be established. A performance appraisal strategy whereby an employee is reviewed by his/her peers who have sufficient opportunity to examine the individual’s job performance. This is a process of identifying, evaluating and developing the work performance of employees in an organization, in order that organizational objectives are more effectively achieved and understood by employees. Performance Improvement Plan when you have identified a performance problem and are looking for ways to improve the performance of an employee. The Performance Improvement Plan plays an integral role in correcting performance discrepancies. It is a tool to monitor and measure the deficient work products, processes and/or behaviors of a particular employee in an effort to improve performance or modify behavior. A total approach to managing people and performance. Involving setting performance aims and expectations for the organization, departments and individuals employees. A complaint brought by one party to an employment contract against another party. 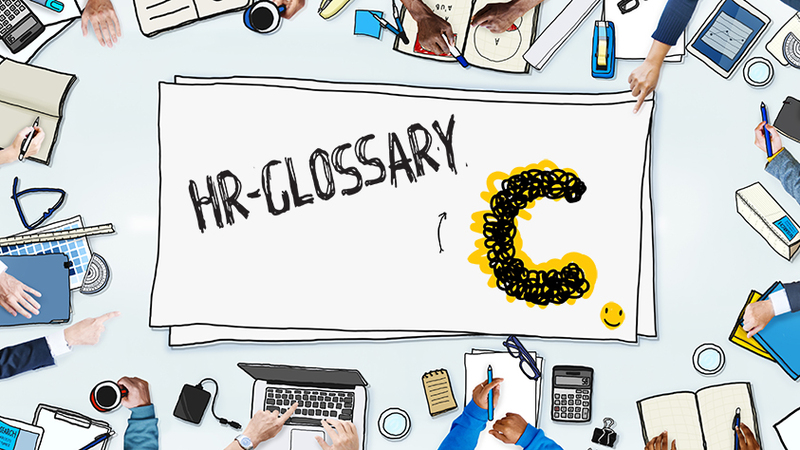 See Part 9 of the Employment Relations Act 2000. Where the parties to an employment agreement agree as part of the agreement that an employee will serve a period of probation or trial after the commencement of the employment. The process or system of ensuring that a product or service should do what the user needs or wants and has a right to expect. There are five dimensions to quality, design, conformance, availability, safety and field use. Drug and alcohol tests administered by an employer which selects employees to be tested on a random basis. The process of bringing into an organization personnel who will possess the appropriate education, qualifications, skills and experience for the post offered. The act of dismissing an employee when that employee is surplus to the requirements of the organization. A summarization in visual form the numbers of incumbents in each job or family of jobs, the number of current vacancies per job and the projected future vacancies. See Succession planning. A document an organization sends to a vendor inviting the vendor to submit a bid for a product or, service. A contract clause requiring executives or other highly skilled employees to refrain from seeking and obtaining employment with competitor organizations in a specific geographical region and for a specified period of time. A ratio of the benefit or profit derived from a specific investment compared to the cost of the investment itself. The ‘right’ of management to make decisions and to run an organization without interference from external or internal forces. The use of insurance and other strategies in an effort to minimize an organization’s exposure to liability in the event a loss or injury occurs. The process of aligning human resources more closely to the strategic and operating objectives of the organization. The process of identifying an organization’s long-term goals and objectives and then determining the best approach for achieving those goals and objectives. Involving identifying a potential candidate to replace core individual employees either known t be leaving the firm at some point in the future and/or whose sudden departure would pose a risk to the operation of the firm. The act of dismissing personnel immediately, usually because the person has committed some act of Gross Misconduct. A form of disciplinary action resulting in an employee being sent home without pay for a specified period of time. Talent Management, often times referred to as Human Capital Management, is the process recruiting, managing, assessing, developing and maintaining an organization’s most important resource—it’s people! An appraisal process whereby an individual is rated on their performance by people who know something about their work. This can include direct reports, peers, managers, customers or clients; in fact anybody who is credible to the individual and is familiar with their work can be included in the feedback process. The individual usually completes a self-assessment exercise on their performance, which is also used in the process. The complete pay package awarded employees on an annual basis, including all forms of money, benefits, services, and in-kind payments. A method of analyzing how employee skill deficits can be addressed through current or future training and professional development programs, as well as determining the types of training/development programs required, and how to prioritize training/development. Groups of workers who have formed incorporated associations relating to the type of work that they perform. The act of terminating an employee’s employment agreement for a reason that the Employment Relations Authority or Employment Court regards as unjustifiable. Depicts pay rates currently being paid for each job within a pay grade in relation with the rankings awarded to each job during the job evaluation process. The gap between the Collective Agreement rate and the rate actually paid. Evidence of geographical variations in wage levels. Whistle blower protection is contained in the Protected Disclosures Act 2000. The Act provides protection to employees against retaliation for reporting illegal acts of employers. An employer may not rightfully retaliate in any way, such as discharging, demoting, suspending or harassing the whistle blower. Employer retaliation of any kind may result in the whistle blower bringing a personal grievance against the employer. Having a measure of control over when, where and how an individuals works, leading to their being able to enjoy an optimal quality of life. Work-life balance is achieved when an individual’s right to a fulfilled life inside and outside paid work is accepted and respected as the norm, to the mutual benefit of the individual, business and society.